After lunch and entertainment in Samoa, we poured ourselves back onto the plane, greeted our flight crew, who always seemed to have had just as good a time as we had, and settled in for the flight to the northeast coast of Australia. We have had the pleasure of visiting Australia twice before but never this particular area. Nearing the Great Barrier Reef, our captain received permission from Cairns flight control to dip our wings and give each side of the plane an aerial view of where we’d be venturing next. From Cairns, we boarded busses for the hour drive to Port Douglas. On the plane, we had had lectures on the aboriginal culture, which we would once again meet up with in the Daintree National Park Rainforest. For touring, we were divided into two groups. We were to go to the Great Barrier Reef on the first day, the nature preserve, Botanical Ark, and Daintree on the second. A World Heritage Site since 1981, the Great Barrier Reef is the world’s largest coral reef system. As it stretches along the coast of Queensland, its square mileage is between that of Montana and New Mexico, to try and put it in perspective. When touring via boat, you are only allowed near a small portion of it. I’m not a snorkeler or scuba diver, so I enjoyed the day, the lunch, and the conversation aboard. Others suited up, had their instructions, and over the side they went! The day had started out with a rainy outlook, but cleared and was sunny for our later shopping in Port Douglas. As in other stops, we were given a choice of local restaurants and so could eat “on the economy” with the tour picking up the check. We also had a group dinner at an outdoor restaurant. Dining under the stars in Australia, very nice. The next day we visited a nature preserve, with begging kangaroos and gimlet-eyed cassowaries. Those, we didn’t feed. Nor did we want to. 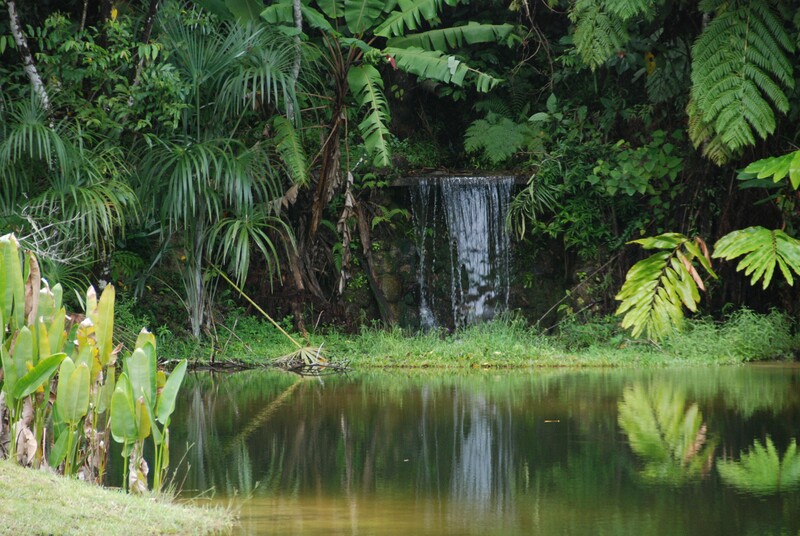 Waterfall at the beautiful Botanical Ark. Credit: Kay Sisk. The Botanical Ark was our next stop. Began thirty years ago by Alan and Susie Carle, an American couple in search of a way to preserve the ethnobotanicals (plants humans use for food, medicine, etc.) that were in danger of disappearing, they have worked closely with the Australian government to build a botanical paradise. We were served a lunch of varied fruits and vegetables, the only thing of which I recognized was the fish. Much of the Daintree in Mossman Gorge is part of the Wet Tropics of Queensland World Heritage site listed in 2015 by UNESCO. 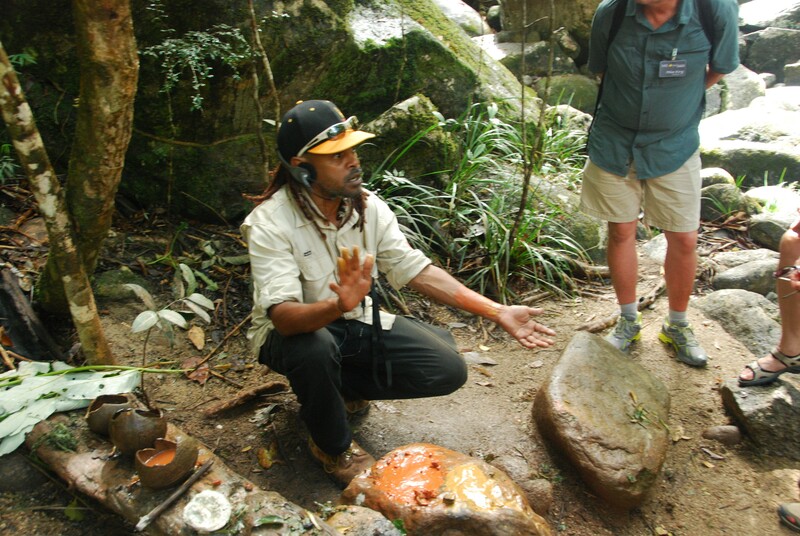 Our aboriginal guide led us through the forest, giving us insight into survival tips and his heritage. Our guide at the Daintree Rainforest. Credit: Kay Sisk. I’m not sure how I felt about our next destination, Siem Reap, Cambodia. I knew Angkor Wat was a massive religious complex and should be on my do-not-miss list of World Heritage sites. But… Cambodia? Yes, Cambodia. I was enchanted with the temple complex and the guides. Before we arrived at our hotel, Raffles Grand Hotel d’Angkor, (very old school with a wire cage elevator for its three stories, gorgeous black and white floors and a heavy key you left at the front desk), we stopped to get our passes for the next two days of touring. Off the bus, photo taken, back on the bus, pass received before the bus left the parking lot. Very efficient and it’s the not-so-charming pink ribbon around our necks in all the Cambodian photos. We stopped at a museum to get a sense of the artwork and statuary of the region and then to Raffles. Angkor Wat. Credit: Kay Sisk. Built as a spiritual home for the Hindu god Vishnu in the 12th century, during the 13th and 14th centuries, Angkor Wat became Buddhist. In 1992, it was declared a World Heritage site and this is what saved it. It had been pillaged and was the site of illegal digs and land mines. 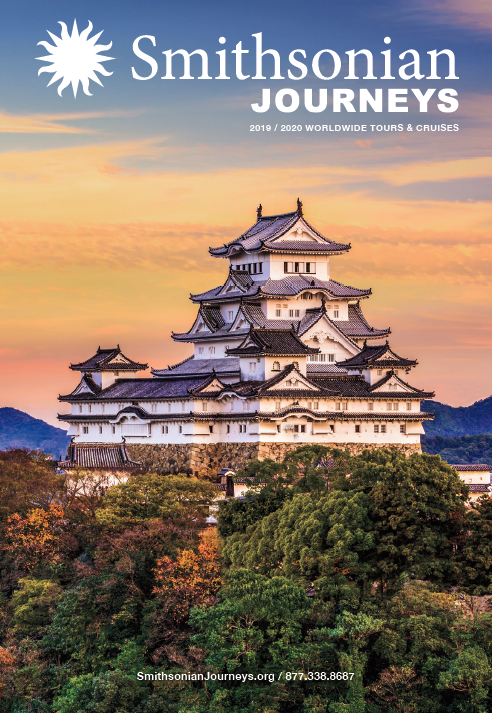 In 1993, UNESCO sought international help to save it and it worked! 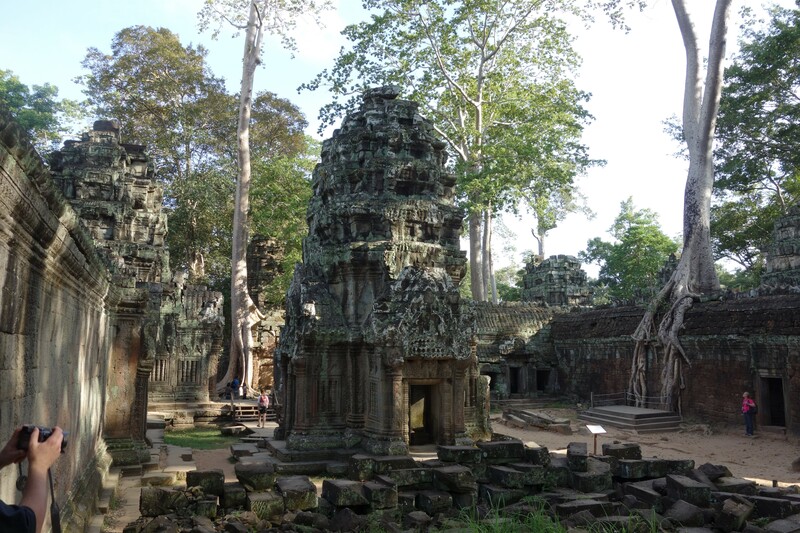 The carvings, the sheer size of it and its accompanying Angkor Thom complex which we visited the next day, were truly amazing and I think, best told in photos—including our elephant ride! Fig Tree Roots at Angkor Thom. Credit: Kay Sisk. We had two interesting dining experiences in Siem Reap. The first was delivered by tuk tuk, think a motorcycle driven rickshaw. It was a bit, um, harrowing as we made our way quickly through crowded early evening streets. The restaurant was a much calmer experience. The next evening we loaded into busses for a surprise dinner, a many course meal under large tents at a temple complex with dancers for entertainment. Alas, it didn’t just rain, it poured. Eventually, the skies cleared and the beautiful, intricate story-telling show went on. We also visited Tonle Sap, the largest freshwater lake in Southeast Asia. The Vietnamese have settled there and made towns on the lake, complete with restaurants, schools, and churches. But the most fascinating part of our visit to the lake was not the tour, but our guides. They were very articulate in bringing home the atrocities of the Pol Pot and Khmer Rouge regime and how it had affected them, their families, and their country. It made real to us something that had happened on the other side of the world and had been but a passing piece on the evening news when we were raising our family. 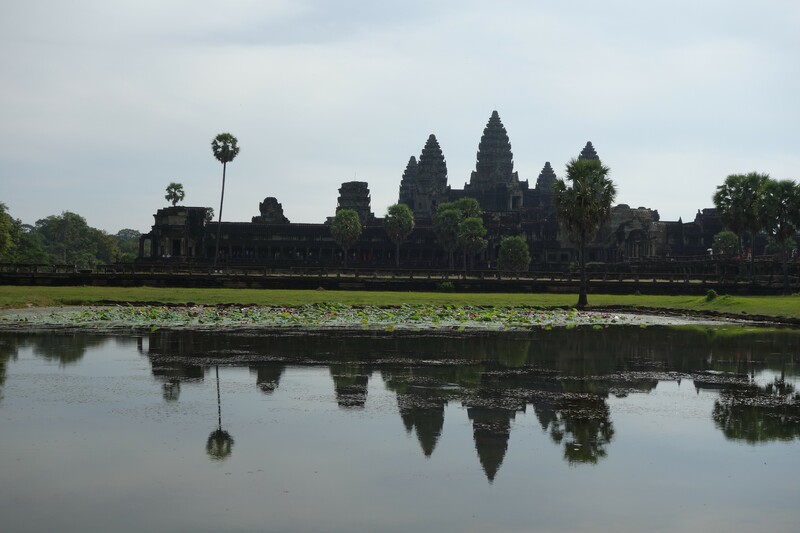 I will always remember Angkor Wat, but I’ll always treasure the new insights I received from the Cambodian people. The Taj Mahal as seen from the guest quarters. Credit: Kay Sisk. 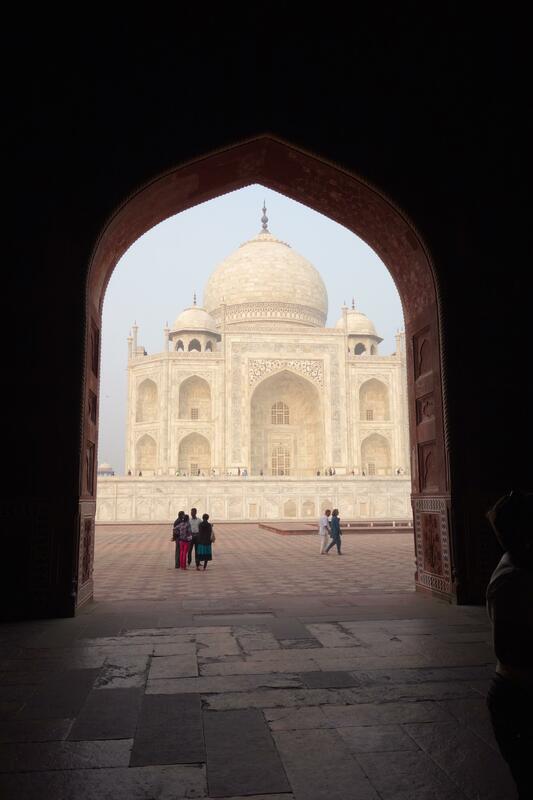 On to exotic India and the city of Agra and its famous Taj Mahal. We were allowed to land at a military base and thereby skip the two hour bus ride from the nearest commercial airport. On the way to the hotel, we toured the Red Fort, a World Heritage site dated from the 16th century. It is still in use militarily today and so we were only allowed to see part of its stunning architecture. From the top floor, we could glimpse at our next morning’s destination, the Taj Mahal. And indeed that’s all the builder of the Taj, Shah Jahan, could do when one of his sons seized the throne and imprisoned him at the Red Fort, allowing him only a look at the tomb he’d built for his beloved wife, Mumtaz Mahal. Our hotel was but a stone’s throw, or a large golf cart ride, from the Taj. If you were on the early tour and I think that was all but ten of us, you met in the bar for coffee and pastries at 5:30. Breakfast would be later. Loaded into the conveyances, we were then divided into men and women for entering into the grounds at 6:30. We were not to have large purses with us and those who did were searched, women by women. Once we joined our “menfolk” on the other side, we began our tour. 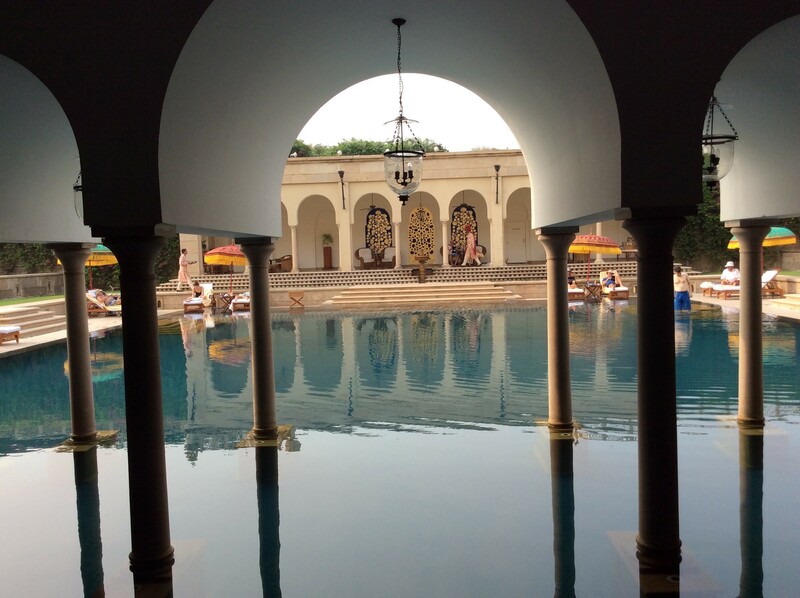 The swimming pool at the Oberoi. Credit: Kay Sisk. I hadn’t realized that the Taj, an iconic example of Mughal architecture, is more than just the Taj. It is surrounded by red sandstone outer walls and flanked by two outbuildings, one of which is a mosque and the other used as a guest house but built for symmetry. The only asymmetrical thing is the tomb chamber itself, where Mumtaz Mahal’s cenotaph is centered and Shah Jahan’s is off to the side. They are actually buried in a crypt below this room. It took 20,000 stone carvers, masons, and artists to complete the Taj Mahal. The four minarets which surround the central building lean slightly outward, lest they collapse and fall into it. We bid India good-bye and looked forward to Tanzania and the Serengeti National Park. To learn more, read Part I and Part III of this three-part series.